Garages can be a blessing and a curse. It's nice to have the space to store everything, but what happens when you store everything??? Things get messy, that's what. Here are ten projects to help you kick the clutter and keep things looking organized! Fall is here and with the new season comes packed schedules for kids and adults alike. If your life could use some highly-visible, analog-style organization, here's a super easy DIY project from Chelsey at The Paper Mama. Looking for an easy weekend project? Make a colorful camp-inspired art piece that doubles as a hanging wall hook. All you'll need are the materials above and you're good to go. I can't wait to try this one. Okay, this isn't so much of a hack as it is a re-purposing idea -- but it's pretty brilliant, so we're sharing it! After seeing this quirky little DIY project, I kinda want to dip everything in colorful plastic! C'mon, admit it, you want to go dip-crazy, too. If you're on board for some colorful customization of totally mundane objects, read on! After recently completing our office makeover, I realized I needed somewhere to put all those random little notes and lists and other office-y bits. You know, something people like to call a "memo board". After looking around, the only options appeared to be giant rectangular boards, emphasis on giant. And rectangular. Since I like to keep things a little quirky (and colorful and covered in pattern), I decided to make my own! How To: Make a Colorful and Modern Mudroom -- from Scratch! Don't have a mudroom? No problem! Here's how to make one out of thin air (and some other materials, of course). I'm a bit of an online shopper... and with online shopping comes cardboard shipping boxes. Lots of 'em. I usually hold on to them "just in case" or take them to our neighborhood recycling bin. 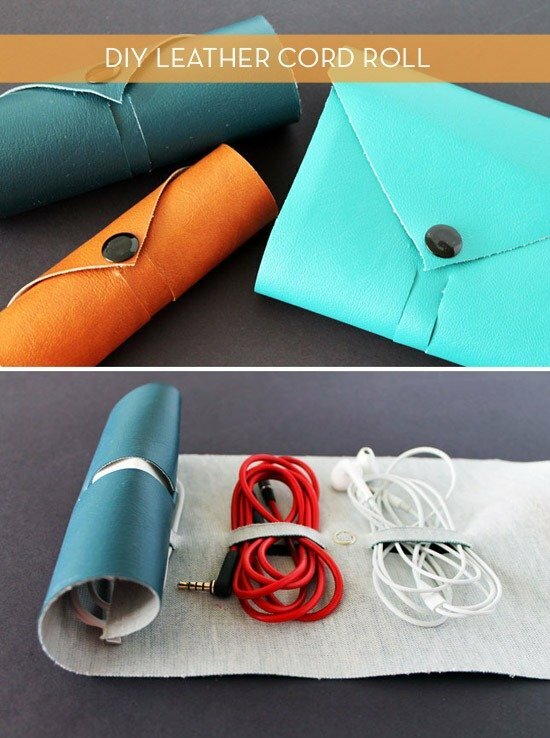 But this clever upcycling project has me thinking about them in a whole new light! While you're rampaging through your spring cleaning checklist, don't forget to give your car a little TLC. Whether you're facing a mound of discarded coffee cups and drive-thru trailings or just a winter's worth of dust and dirt, here are 8 quick tips for cleaning your car's interior -- and keeping it that way! I'm the type that only keeps magazines around for a short period of time before donating or recycling them, but I love the idea of having a small, rotating collection readily available to peruse. 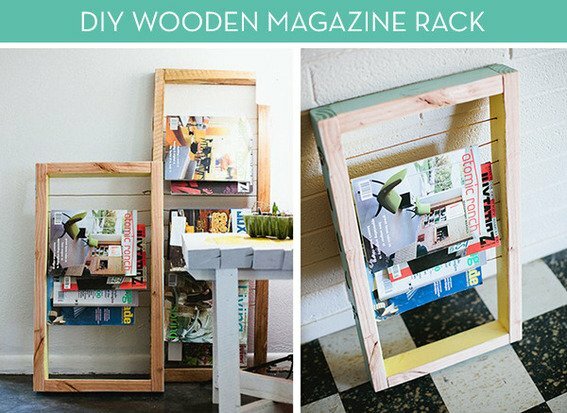 This simple DIY magazine rack would be perfect for storing a few faves! Ahh, this DIY project is my usual speed: something that looks gorgeous in the end and only requires a few simple materials and a little bit of time! I'll be the first to admit that my jewelry organization situation is pretty horrendous. The knobs on my closet doors are home to countless necklaces, half of which fall off if one happens to even glance in their general direction. Fortunately, there are DIY jewelry holders aplenty, a few of which I have my eye on for upcoming weekend projects. Check out all 25 below and let me know which one is your fave! Most bulletin boards are boring, but there's nothing dull about this bright yellow dazzler. This brilliant Ikea hack uses the Ung Drill frame and lots of wine corks to create a beautiful and functional board worthy of proud display in your living room or kitchen. Or office. Or anywhere, really! Roundup: 21 Creative DIY Wall Hook and Coat Rack Projects! I'll admit that the coat rack/wall hook situation in our entryway (which is really just our living room) needs a little help. When we have guests over, they inevitably ask, "So... uh, where do you want me to put my coat?" -- which means "Dude. Get a coat rack already." We end up tossing jackets over the back of a random piece of furniture and call it day, but I'd love to surprise our friends with an actual, honest-to-goodness coat rack or wall hook the next time they come over. One of these modern DIY options ought to do the trick! I love this creative DIY solution for keeping small office and craft supplies available and within reach! It's especially useful for small spaces or work surfaces, don't you think?